The inspiration for much of David Barnes art work are the mountains of Snowdonia and the coastline of north Wales and Anglesey. As well as painting the dark brooding colours of the north Wales landscape. His paintings are influenced by Welsh artists Sir Kyffin Williams, Gwilym Prichard and Wynne Jenkins. This can be seen in ''Above Llanberis'' where the simple, naÃ¯ve style complements the rugged shapes of the mountains of Snowdonia. Winding roads seem to lead us into the mountains. 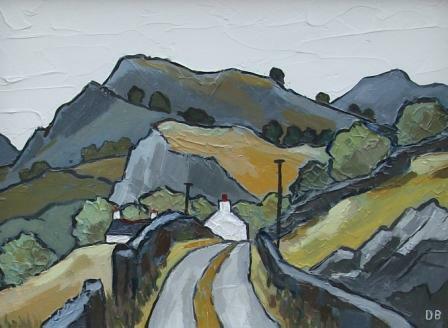 David Barnes uses an earthy palette and clear and simple lines to describe the landscape he sees in North Wales. David Barnes paintings are highly textural. He uses a palette knife, painting in oils and using a thick impasto technique to produce bold strokes that add strength and texture to his paintings, giving it a sculptured feel, particularly apt in ''Above Llanberis'' where the forms of the mountains feature so prominently.